I’ve been spending entirely way too much time with my little boys these last couple of weeks which is both a blessing and a curse. I love summers when we have picnics in our playset, beach days, marble races and muffin tin meals, because I have so much more time than when I’m teaching everyday. Very little real work tends to get done when you have to stop for, impromptu water fights, super hero races, obstacle course building and car races and car races and more car races. More and more car races has prompted me to create some new items that will appeal to my own little gear heads at home as my 4 year old gets ready to head off to pre-school and my 6 year old heads to kindergarten. But I was informed by my own resident car experts that my collection of activities were not complete. Of course, in addition to car races and car races and more car races, I’m convinced you can use cars to teach darn near anything and get this . . . you can differentiate it, not just by interest (we all know that for a little gearhead like my boys,a car is the hook you need to get them to WANT to do the activity) but also by learning profile (kinesthetic learners LOVE cars) and by readiness. Yes, I said readiness. For example. . .
Here’s a ‘self-correcting’ activity (yes I said self-correcting – can I get a little Hallelujah from the audience) that you can throw in a word work center for your students to work at independently or with a friend. And, oh yea, it meets Common Core Standards too. Students pick a card which is folded over and secured with a clothes pin. They place the card on the mat and look at the picture. 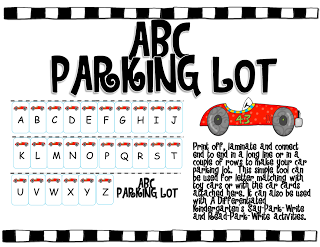 They determine which letter sound the word starts with and places their car on the parking space (either a toy car or a car card that I provided in the activity) and writes the letter at the bottom of the mat. Then they remove the clothes pin and open the card to see if they are correct. 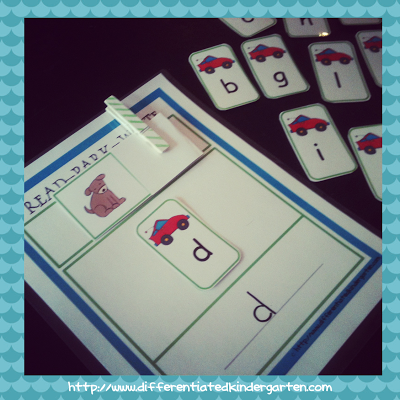 This one is tiered so that for students ready to move on from beginning letter sounds, there are additional cards (tier 2) that will let them work on the sounds they hear at the end of the word. Hey! Now we’re differentiating in response to interest AND readiness levels. It’s available in my TpT store if you’d like to check them out. My son loves this activity, but, in no uncertain terms, told me that it needed a ‘parking lot’ for his cars so he could keep them organized and know where they are when he was looking for a certain letter. So I came up with this FREEBIE to park you own cars on. What he didn’t realize is that when he was parking his cars, he was really matching up lowercase letters to capital letters. I love it when they’re learning, and they don’t even know it. You can get it by clicking either the picture above or below. It’s FREE! So what ‘cha waiting for? Of course at the beginning of the year, you’ll have those little peeps that won’t even be able to recognize their letters nor write them. 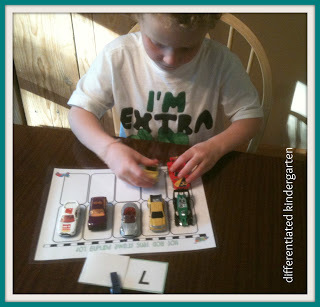 For those little ones and for any of them that need the practice in making their letters correctly, you’re going to want to take advantage of the fact that cars have WHEELS that allow them to move. They allow kinesthetic learners do what they do best too . . . MOVE. 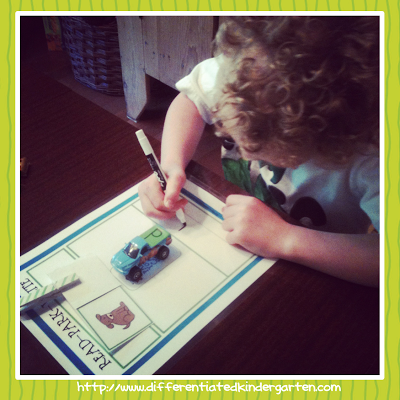 If you use a little FROG brand painters tape on your floor you can practice writing your letters by ‘driving’ the cars over the letters. It’s a guaranteed ‘ask for it again and again’ activity. Don’t have room on your floor? 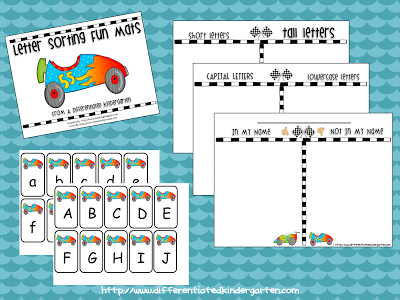 How about downloading a set of these FABULOUS highway letter cards from Making Learning Fun to use at a table or desk. Click on the picture below to take you to the link. Of course, if you take that same tape (it’s my favorite) and place a small piece with a letter written on the back, you can sort letters in your name, capital and lowercase letters or even short and tall letters. If you’d like a set of these fun sorting mats just click on the picture to get your set. 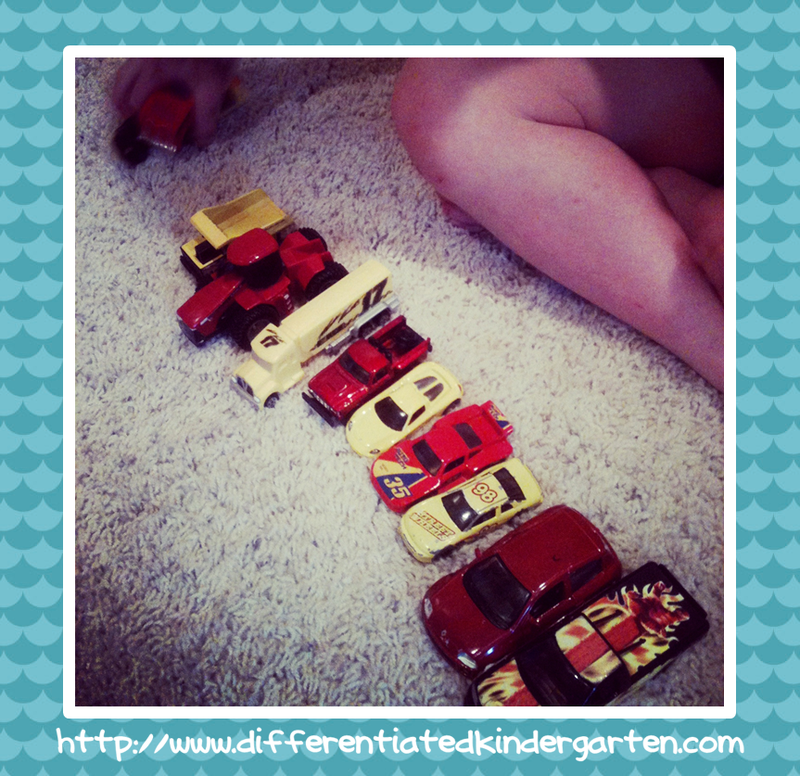 Don’t worry if you don’t have enough ‘real’ match box cars for this activity. 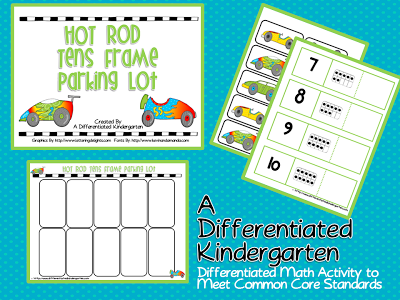 I included a set of car playing cards that can be used for this activity as well. 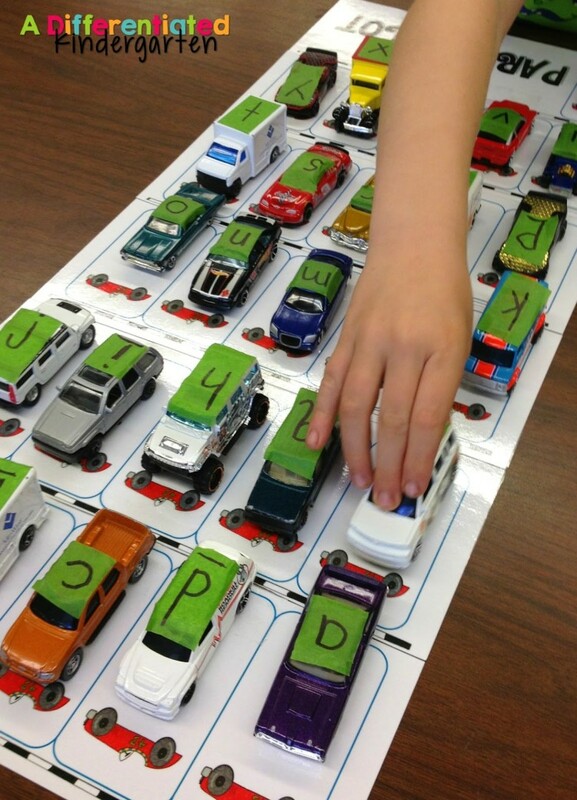 I’ve even used cars to help my students with nonsense word fluency. 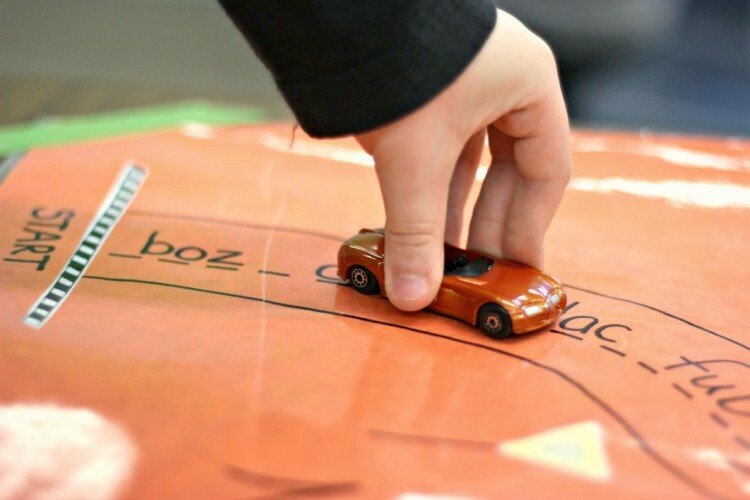 When I drew some roads on a big piece of paper, wrote some nonsense words down, handed my kiddos a toy car and a timer, this literacy center became an instant favorite. 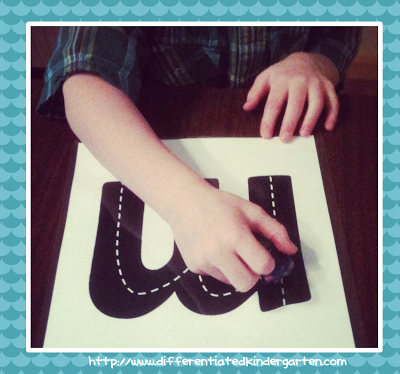 You can click on the picture below to learn about different hands-on activities to practice nonsense words. 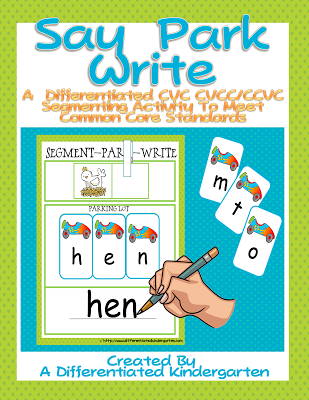 For students who are beyond this activity and ready to start segmenting, there is a companion activity Say-Park-Write that is tiered for students working on CVC and CCVC/CVCC words. And then there’s all the great MATH activities you can do! I was surprised when my 6 year old found as much joy in sorting as my 4 year old did. The 6 year old’s sorting was much more complex of course. He didn’t merely sort by color and call it good. Oh no, he sorted by construction vehicle and then race cars and utility vehicles, motor cycles and tractors with a miscellaneous pile for whatever didn’t fit. I also had them making patterns as well. 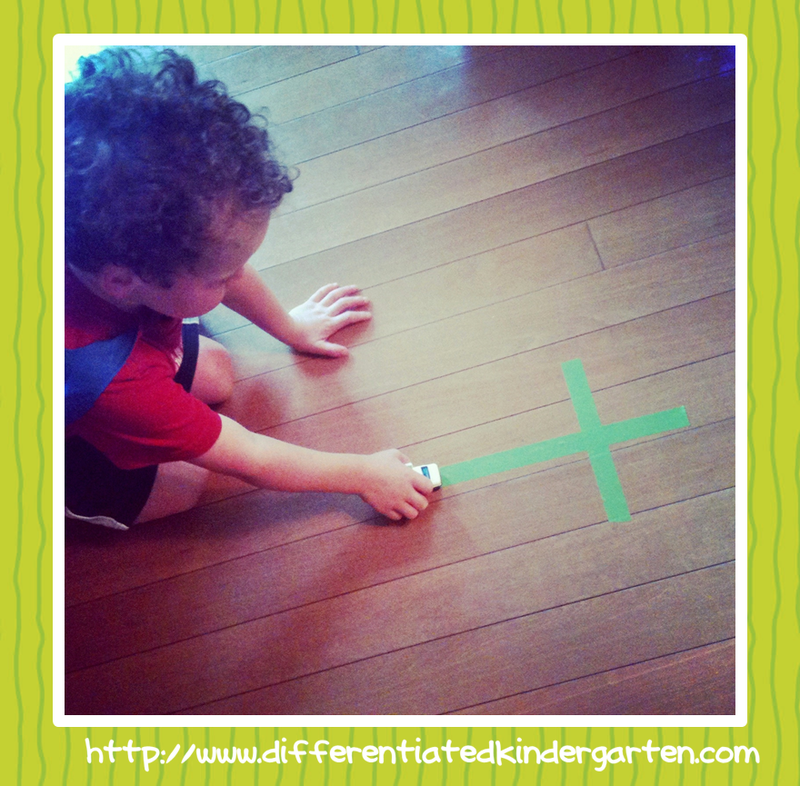 Could you use this as an early in the year math station? ABSOLUTELY. 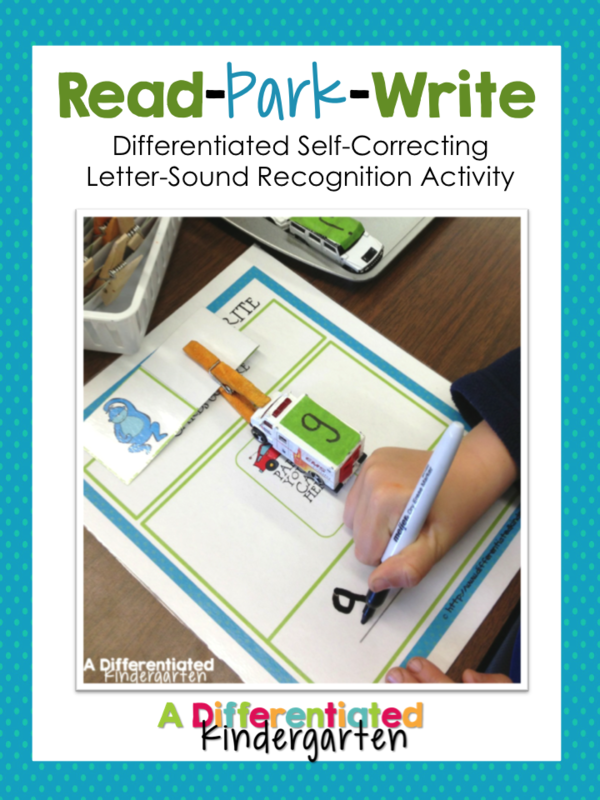 It would be a great way to introduce stations to your students with an engaging activity. Plus, like my six year old, I think that you’ll find students who have already mastered simple patterns and sorting, looking for more complex ways of using this center. Need your own ‘I can’ poster for it? Just grab a copy of mine by clicking on the poster picture below. Of course, you can also count cars. There’s a couple of ways you can do this in your classroom. 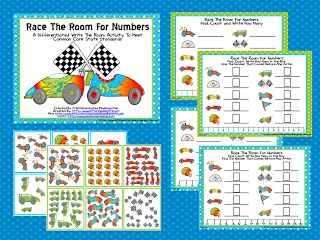 To appeal to your kinesthetic learners, you might want to try this Write The Room activity – Race The Room For Numbers. It has two tiered levels (1-10 and 10-20) with two activities for each level and address Common Core Standards to boot. Your students will search around the room for the counting cards, one task has them just writing the number they count and for more advanced learners, they will also write the number that comes before and after. Differentiated for learning profile and readiness! 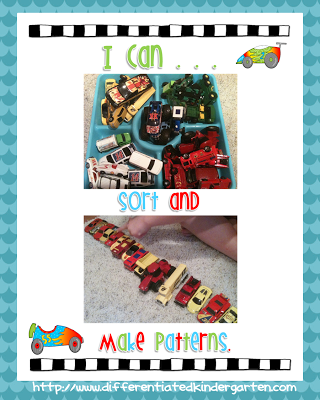 You can also work with cars and ten frames. This one is a great way to show numeracy. It addressses common core standards, is self-correcting AND tiered to meet the readiness levels of your various students . . . differentiation done for you! 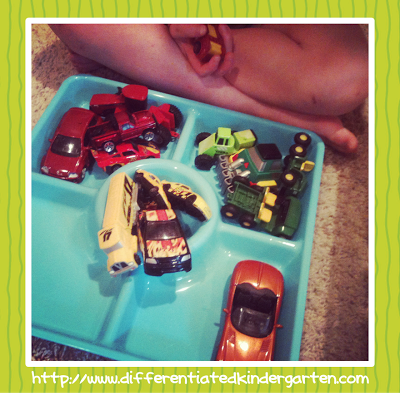 You can play it with little toy cars or with the car cards I provide. So this is what you can do when you’re inspired by the little people who spend the summer with you. Anyway, I have to go. There’s a car race starting in 3 minutes, and I get the really cool green race car to drive! Goodie! This is so great! I just rounded up a ton of my son’s old cars the other day and was trying to think of a way to use them in my second grade room. You just gave me so many ideas! And I love the folded back card with the clothespin. YES! 2nd graders love to play with cars too. You can measure with them (non-standard measurement) . . . what else? I was thinking that I could still put the letters on them and let the kids make words with them. And we start cursive at the end of the year, and they could easily drive the car without stopping over the cursive letters in order to feel the “flow” of the letters. And you can put equations on them and have them “parked” in the garage that features the correct total. Sight word sorta like bingo- parking cars on the road map location of a called out word, whoever gets to the mechanic and back wins. And in general, board game markers for science and social studies, as they travel a map they answer content questions before zooming to the next destination. Measurement wise- the balance scale as well, what is it as heavy as? I’ll try to come up with some more, thoughts usually come to me as I’m falling asleep. Amy, check out your local Goodwill and garage sales for them. I hope your kiddos love them as much as mine do. Thank you!! 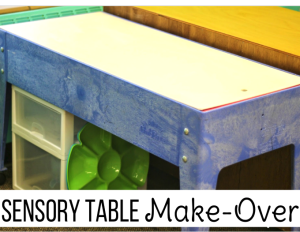 So many great ideas and I think my little firsties will LOVE them! Yeah. I’m so glad you’ll be able to use these ideas. Wow, those are some cool ideas! I love the fact that each of these activities turns learning into play. Or play into learning. Its all the same really… I think kids learn way more when they’re having fun and actually want to do the activity! These are fantastic!!!! My kiddos love playing with cars. They’re going to go crazy when they see this!! Thank you for being so creative!! 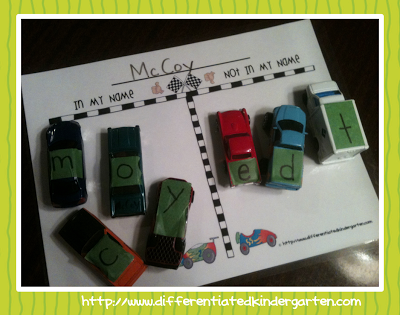 You have such great ideas:) I need to go find some matchbox cars for my classroom! Thank you for the freebie! My boys are going to love this! I am now following your blog. Please come by mine and follow too. I love to share ideas with other teachers. What fun games for those little boys!! Some girls would love it too! These are awesome! So many options and uses! Thank you so much for sharing your talents and expertise!! I love these! Thank you SO much for all of the wonderful items you make and share! Thanks so much for sharing these! I’m printing them off and getting ready to go to school and get them laminated and ready to use. The boys, especially will love these, but I’m sure the girls will too! http://www.hugsfortheteacher.blogspot.com to claim your award. Please join my blog while you are there.